Celebrating the life of Walter J. Hall, Jr.
Obituary for Walter J. Hall, Jr.
Dr. Walter J. 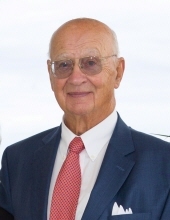 Hall, Jr. passed away peacefully on October 10, 2018 at the age of 88 in Lancaster, PA. Born in Shamokin, PA, he was the son of Walter J. Hall Sr. and Kathryn (Steckman) Hall. He moved to Springfield, PA in 1946, where he met Nancy (Anna Beitzel) Hall. They were both active members of Covenant United Methodist Church, where they were married 65 years ago. They moved to Media in 1975, and Lancaster in 2004. Walter was a graduate of Springfield HS, Bucknell U, Temple U, and Columbia Teacher’s College where he received a Doctorate in Education. He was an educator in the public school system for 38 years with most of that time as a Principal and Administrator in the Haverford Township School District. In 1959, Walter and Nancy moved to Munich, Germany for two years where Walter taught at the US Army School; they traveled extensively around the world for the rest of their lives. Walter enjoyed spending time with his family, especially in Ocean City, NJ or Zermatt, Switzerland. He loved to bike, ski, and play tennis. Walter was a proud Bucknell Bison, where he played football and basketball. Walter is survived by his wife Nancy, four children, Kathy (Tom) Overholt, Pete (Marta), Jeff (Margaret), Doug (Michele), ten grandchildren and two great-grandchildren. He is also survived by sisters-in-law Anne Hall and Mary Lou Beitzel and was predeceased by brothers Chuck and Tom, brother-in-law Spike Beitzel and sister-in-law Jeanne Hall. Those who knew him will remember his friendliness, humor, loyalty to his family and commitment to community service. We are forever grateful for his love. Memorial service to be held at Covenant United Methodist Church, 212 W. Springfield Road, Springfield, PA, 19064, at 11 am Saturday, October 20, to be preceded by a calling hour beginning at 10 am. Donations in lieu of flowers may be made to Covenant United Methodist Church, 212 W. Springfield Road, Springfield, PA, 19064. To send flowers or a remembrance gift to the family of Walter J. Hall, Jr., please visit our Tribute Store. "Email Address" would like to share the life celebration of Walter J. Hall, Jr.. Click on the "link" to go to share a favorite memory or leave a condolence message for the family.